If you can rewrite algorithms into Maps and Reduces, and your problem can be broken up into small pieces solvable in parallel, then MapReduce might be a potential distributed problem solving approach to your large datasets. We will start the introduction of Hadoop MapReduce using MR1 and then briefly with MR2. A MapReduce job usually splits the input data-set into independent chunks which are processed by the map tasks in a completely parallel manner. The framework sorts the outputs of the maps, which are then input to the reduce tasks. Typically both the input and the output of the job are stored in a file-system (e.g., HDFS on Apache Hadoop). The framework takes care of scheduling tasks, monitoring them and re-executes the failed tasks. The framework takes care of failures. It is designed to detect and handle failures at the application layer, so delivering a highly-available service on top of a cluster of servers, each of which may be prone to failures. If a server with one copy of the data is unavailable, another server has a copy of the same key/value pair, which can be used to solve the same sub-task. The JobTracker (see below) keeps track of it all. 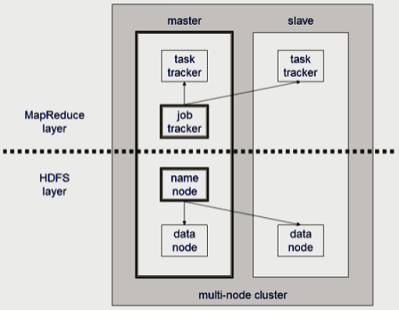 Typically the compute nodes and the storage nodes are the same, that is, the MapReduce framework and the Hadoop Distributed File System are running on the same set of nodes (see the above diagram). This configuration allows the framework to effectively schedule tasks on the nodes where data is already present, resulting in lower network I/O and very high aggregate bandwidth across the cluster. The Hadoop job client then submits the job (jar/executable etc.) and configuration to the JobTracker. In MR1, JobTracker manages and monitors both the resources and the MapReduce Job and task scheduling, which makes the JobTracker a single point of failure (SPOF) in a cluster. Also, the cluster cannot be scaled efficiently. The JobTracker will first determine the number of splits from the input path and select some TaskTracker based on their network proximity to the data sources, then the JobTracker send the task requests to those selected TaskTrackers. The TaskTracker spawns a separate JVM processes to do the actual work; this is to ensure that process failure does not take down the task tracker. The TaskTracker monitors these spawned processes, capturing the output and exit codes. When the process finishes, successfully or not, the tracker notifies the JobTracker. The TaskTrackers also send out heartbeat messages to the JobTracker, usually every few minutes, to reassure the JobTracker that it is still alive. These message also inform the JobTracker of the number of available slots, so the JobTracker can stay up to date with where in the cluster work can be delegated. As the JobTracker functionality is split between the ResourceManager and ApplicationMaster. Hadoop may be run on much larger clusters on MR2. The MapReduce framework consists of a single master ResourceManager, one slave NodeManager per cluster-node, and MRAppMaster per application (see tutorial). BlueHost is one of the best web-hosting provider for any hosting services you might require.